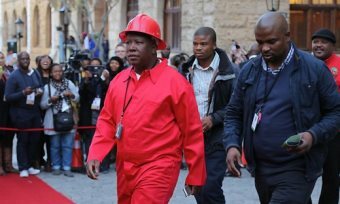 AFRICANGLOBE – With the arrival of a youthful political force in the name of Julius Malema’s Economic Freedom Fighters (EFF), who have made the land ownership issue a central theme of their agenda, the unresolved land distribution question, 21 years into democracy, is reaching boiling point in South Africa. Correspondent Pusch Commey contends the time for diplomacy is effectively over. There is no doubt that the South African government, under its beleaguered President Jacob Zuma, is feeling the heat, as the EFF relentlessly remind the ruling African National Congress at every opportunity to resolve the question of disproportionate land ownership between the white minority and African majority South Africans. The EFF has not made a secret of their encouragement of potential land invasions. Their populism, a news headline and vote-catching stunt, has got the ruling party worried about a potentially explosive issue. The most recent evidence as to what can happen if this unfinished business, which is closely linked to colonialism and apartheid, is left unresolved, is what students at the elite University of Cape Town did on April 9. To cheers and jeers, they dismantled and took down the campus statue of one of Africa’s leading symbols of land and natural resources dispossession — Cecil John Rhodes. His adventures or misadventures in search of African resources and wealth stretched across Southern Africa, leaving in their wake festering injustices still being felt to this day. The statue had graced the campus since 1934. The university is built on the land that the arch-imperialist Rhodes had donated after he forcefully took it away from the indigenous population that lived on it for centuries before his adventures in Africa began. The protest spread to other campuses as far afield as the University of Kwazulu-Natal, 1600km away, where the statue of King George V was smeared with white paint. The EFF has subsequently moved to burn a war memorial statue of a British soldier in the town of Uitenhage. The statue of former President Paul Kruger, an Afrikaner hero during the Anglo-Boer War, 60 years on Church Square in Pretoria, was next, with green paint. In Port Elizabeth, the statue of Queen Victoria also got a green paint treatment. And so did that of the Afrikaner General Louis Botha, in front of parliament in Cape Town. The statues, symbols of colonialism and apartheid, still standing 21 years into black freedom, like the land question have become a thorny issue and subsequently there has been heated debate on what constitutes history (as opponents claim they are part of South African history and as such, removing them erases and dishonours that history). But to the 80 percent black majority, the land is a real legacy of economic exclusion and these symbols are a legacy of pain, both psychological and physical. They serve as constant reminders of subjugation and exploitation. 20 Years On, Who Owns What? Why the land question is of such crucial importance in South Africa is simple. Countries consist of land areas or territories. Resources from the land, in conjunction with labour, capital, innovation and sales, create wealth and well-being. Without control of land and resources, a pathway to wealth is severely hindered. It is thus no mystery that colonial conquests were about territory and resources, and why over 90 percent of all wars in history have been fought over land. It is also no wonder that the first act of “legalised” dispossession by the white race after reconciliation following the bitter Anglo-Boer War (1899-1902) was the 1913 Land Act, which brazenly confiscated 87 percent of African land and resources. After some 100 years, the first real land audit in South Africa was completed in 2013. The landmass of the republic was 122 million hectares. Of this the State owned 17 million hectares or 14 percent. It included the sites on which 192 000 low- cost houses for the poor are built, as the government is still the registered owner of these properties. There was a physical inspection of 1,15 million pieces of land throughout the country between October 2011 and March 2013 while 79 percent of the land was in the hands of private individuals and organisations. The audit was unable to establish who owned 8.3 percent of the land. The 79 percent was overwhelmingly and effectively owned by whites, who currently constitute about 9 percent of the population. The patterns of ownership and its history continue to poison South Africa’s slow transition. This history has meant that the 80 percent majority black population have been boxed into the role of serfs in a neo-feudal system. Inter-generationally this has been a major cause of poverty, as they have no access to land to leverage for capital or for other purposes. It is a recipe for big trouble if it is left to linger. This inequity has contributed immensely to the figures surrounding the percentage ownership of the South African economy. Land and wealthFeeling the kitchen heat, the otherwise centrist ANC government, which has held out for so long, is being forced left. 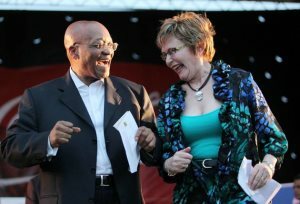 President Zuma caused some consternation when he announced that blacks only owned 3% of the economy. The controllers of the Johannesburg Stock Exchange were quick to react, claiming that the figure was actually 22% when taking into account pension funds and other black investments. But the government has stuck to its guns. The measure, they contend, was ownership and control, and not a nebulous calculation. The difficulty has been how to overcome the challenges of a historical racial stratification without destroying the economy or food security. Apart from other land-based wealth creation resources like tourism, agriculture has been at the centre-stage of the discourse, because it takes up large portions of land space and contributes R84bn ($12bn) to the economy, about 3 percent of GDP. The food value chain is however worth seven times more. There was a lot of consternation in the agriculture sector, when President Zuma announced during his State of the Nation address in February that farmers would be forbidden to own more than one farm and that ownership of farmland would be limited to 12 000 hectares. Foreigners would be forbidden to own land and farmers would have to relinquish half of their farmland to workers. The announcement was interpreted more as politicking than anything else, following pressure from the Malema’s EFF. But a bold statement it was. However, the farmers’ organisation AgriSA is already up in arms, arguing that farms thrive on economies of scale and cutting them up will make them globally uncompetitive. Meanwhile, half a million farm jobs have been lost over recent years, partly due to exploitative wages, and a decline in farming activity. Many potential black farmers are confined to being low wage earners, when actually, with proper support and if granted access to land, training, capital and access to markets, that have been monopolised by a few whites, they could themselves become successful farmers. And the country’s massive unemployment could be reduced if the black population was given access to land, to earn a living. National food security has falsely been equated with large-scale commercial farming, yet the potential for millions of black smallholders to increase production, raise incomes and create much-needed jobs has been overlooked. The rapid economic growth of most Southeast Asian economies was premised on land reform and agricultural transformation. Rural unemployment, standing at 52 percent, twice the national average, and rural urban drift could be seriously tackled with a properly managed land reform and support that does not jeopardise the industry. But the how, and co-operation from all and sundry, is what is giving the South African government and experts sleepless nights. It seems economic transformation will be far more difficult than the political transformation in 1994, which in itself was hailed a miracle. All this is down to the fact that land in South Africa still remains in the hands of a few.